The nectar-less ghost flower (mohavea confertiflora) that grows in the Mojave and Sonoran deserts has ingenious strategies for attracting pollinators: it mimics the appearance of another desert flower with lots of nectar, and the ghost flower's center markings are shaped like a female bee (Xeralictus) — here come the male bees to do their work! It's a difficult assignment for a perfumer to mimic the scent of a wild, desert flower. The desert flowers I've smelled possess a "certain something" I've never encountered in perfumes; they have "clear," fresh and clean aromas, with floral and fruity aspects that are hard to describe, let alone duplicate. I imagine a successful desert flower scent would smell fantastic, but wouldn't last too long on skin. Byredo Mojave Ghost1 attempts to mimic the scent of an exotic flower's perfume and to attract pollinators (buyers) but it's only partly successful. With Mojave Ghost, Byredo has a great name and imagery to draw upon, but has created an insipid fragrance that's more department store than niche. Mojave Ghost opens with a rich and warm fruit accord; a combo of mamey and peach. These fruit notes are sweet, and soon more sweetness arrives with the scents of vanilla, and vanillic "chantilly" musk and amber. At times, I get hints of cedar and wood shavings (the sandalwood, perhaps), but never do magnolia or violet materialize, only a character-less, artificial "flower" note. As it dries on skin, Mojave Ghost's fruit notes become overripe, sour (the aroma is like the scent of very tangy peach yogurt); the extreme dry down smells stale. Mojave Ghost has so-so sillage and lasting power and, to my nose, is feminine, not unisex. If you want to smell a real ghost flower, the blooming season is almost here; those of you in California, Nevada and western Arizona are close to the action. If you've smelled a ghost flower, please share your descriptions of its scent. 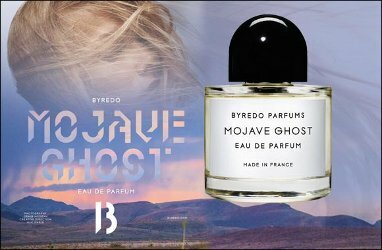 Byredo Mojave Ghost is available in 50 and 100 ml Eau de Parfum, $145/$220 (truly, aspirational pricing!) For buying information, see the listing for Byredo under Perfume Houses. 1. Fragrance notes of: ambrette, mamey sapote, violet, magnolia, sandalwood, chantilly musk, 'crisp' amber, cedarwood. Note: bottom image of a ghost flower via Wikimedia Commons. Too bad. The name alone had me thinking this would be a good one. Unfortunately I’ve never been to the desert in springtime but I would love to see Death Valley in bloom some day. I’ve seen Death Valley in bloom. I don’t remember any Ghost Flowers, but it was still beautiful and a great experience. That place is so cool with or without flowers. Jonas: I lived in L.A. for almost 15 years and never went to Death Valley either! Next time I’m in So Cal in late winter/early spring, I’m going. Anza Borrego State Park in SoCal is amazing when the wildflowers / cacti bloom in spring! It is! I’ve gone a couple times. This year should be good since we got a good amount of rain this winter, but don’t think I’ll be able to make it out. I haven’t smelled this particular cactus, but the other cactus flowers I’ve smelled were indeed wonderful. I hope you do a field trip and report back, Kevin! I got a sample of this as part of a free gift for the Beauty Event at Neiman Marcus. I was excited to try this since I have never experienced a Byredo fragrance. It must not have been too great, because I can’t remember what it smelled like. It definitely didn’t “wow” me. scentfromabove: Byredo Pulp remains my favorite from the line…hope they have not fiddled with the formula since it was released. It’s been on my to-buy list for ages. HA! Pulp is my favourite too. Got a FB for Christmas and absolutely love it. Here in Florida we have some cacti that seem to attch themselves to Palm trunks (or light poles!) and are tall and slender with short unimpressive “stickers.” But at certain times of the year and in the dead of night they explode into blooms that are a gorgeous creamy yellow to incandescent white. They bloom only for about a week or two and they don’t really have any scent that I could discern. The apartment I lived in my youth had them frowing up all the palms on the property- just beautiful! Too bad the perfume doesn’t measure up to the real thing. Oh, that would be “growing” not “frowing” – Dang autocorrect!! Deva…night-blooming cereus? 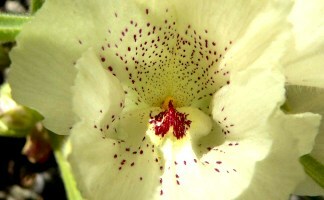 Many of them are very fragrant…and gorgeous! Holy Cow! You know your cacti young man! I just googled night blooming cereus and that’s it! Don’t remember it having and scent, though I could have completely forgotten by now. I do remember how beautiful those blooms were, and all the more so as they were so short lived. Awww, I like this one – I find it a fun warm weather fruity-musky thing. I’m a fairly big Byredo fan, however. I wore my Palermo sample today. I also have Bal d’Afrique hand cream, and Gypsy Water body lotion and fragrance. Springpansy, Oh, forgot about Bal d’Afrique…like that one. You’re right Kevin, Mojave Ghost does have a great name and associated imagery. I’d love a fragrance that could conjure up the feeling of Byredo’s ad. uday: wish comme des garcons would try its hand at a “desert flower”…could be interesting! This is incredible on my skin! When I tried it first time, I fell in love, this is my scent. I don’t care Byredo created better than this, if you can smell on me, you must say: great Wood, woody and wood again with a dry-powderly flowers. I really love this perfume. I even had a lady embarrass me by loudly proclaiming I smell amazing and she wanted to stand next to me all day so she could smell me. It is kind of expensive for me though.